Think BIG, draw BIG and create BIG! National Science Week was so full of creative activities for me as I got to graphically record, draw and create BIG MakerSpaces with people! I got this amazing opportunity by working with a couple of inspiring women of STEAM (Science, Technology, Engineering, Arts & Mathematics), Karen Peterson the CEO of the National Girls Collaborative Project in the US and Dr Lindy Orwin of the University of Southern Queensland (USQ). My alter ego, Dr Suzie Starfish, facilitated her very own MakerSpace at USQs beautiful Toowoomba campus, with teachers and researchers. The MakerSpace was all about creating BIG thinking for our Living Oceans, by focusing on the biggest shark in the sea, the Whale Shark. 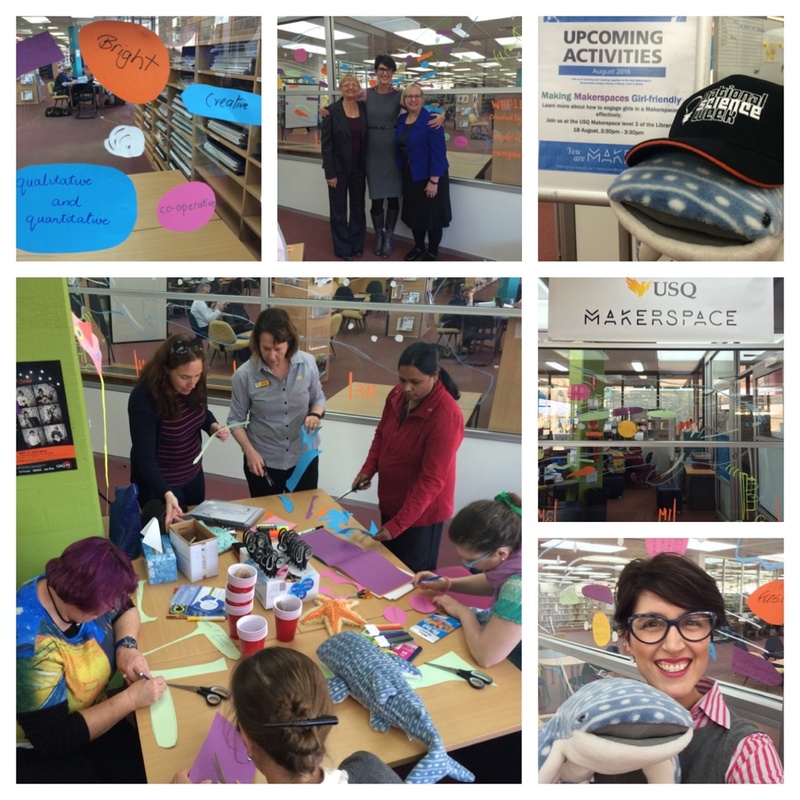 The science and technology of tagging Whale Sharks was discussed, along with putting the “A” in STEAM by working with participants to create a life-sized Whale Shark on the glass walls of the MakerSpace! We then discussed ways that science and technology helps protect and manage BIG ocean species and how MakerSpaces could be more girl-friendly when focusing on these BIG STEAM issues. As you can see from the photos there was a lot of BIG FUN and CREATIVITY happening in this MakerSpace for our Living Oceans! You can follow my creative journey via my alter ego Dr Suzie Starfish on Facebook (https://www.facebook.com/drsuziestarfish/) and @suepillans on Twitter and Instagram. ← Lights, camera, STEM in action! !